Royal IHC has been awarded a contract to modify McDermott International Inc.’s pipelay and construction vessel AMAZON. It includes the delivery of an innovative and complete J-lay system to the Houston-based company. 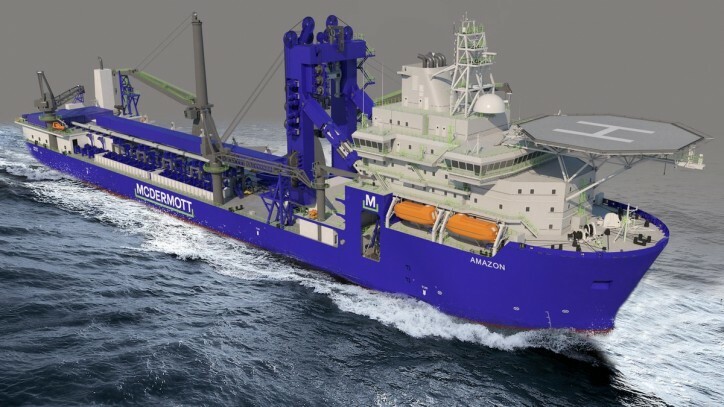 The contract was signed by McDermott’s Global Vice President Marine Assets & Operations Alan Marriott and Royal IHC’s Executive Director Services Diederik van Rijn. IHC will be responsible for the overall management of the modification project, from the design through to the integration of the new equipment. It includes the build and installation of the IHC-designed and patented J-lay system, and associated onboard multi-joint factory, modifications to the ship’s structures, and the removal and replacement of the equipment and commissioning. The physical modifications comprise the removal of the existing pipelay system and its replacement with a new J-lay system with a top dynamic capacity of 1,500 tonnes. The J-lay system will be able to handle every variety of pipe including normal flowlines, export lines, and various pipe-in-pipe configurations, ranging in size from 4.5 to 24 inches with wall thicknesses approaching 2 inches. The AMAZON will be transferred to IHC in The Netherlands for its physical conversion in August 2019, with the delivery of the upgraded J-lay vessel scheduled for summer of 2020. Once the modifications are complete, the AMAZON will meet the industry’s requirement for pipelay and construction in the ultra-deepwater market.